This time, the judges got it right. All three ringside officials concluded that Manny Pacquiao beat Timothy Bradley in their rematch in Las Vegas on Saturday night – a sharp contrast to the scene in June 2012, when two of the three somehow managed to deny Pacquiao a win most observers thought he clearly deserved. And Tim Bradley got it wrong. He claimed repeatedly in the build-up to the fight that Pacquiao had "lost his fire"; if he has, he did an extraordinarily good job of disguising the fact through 12 fast-paced and frequently intense rounds of skillful action. Besides, boxing is about a lot more than fire. It is also about strategy and adjustments; most of all, of course, it is about hitting your opponent more effectively than he hits you. And while Bradley spent much of the fight looking to land a haymaker that would end Pacquiao's night prematurely, Pacquiao spent the second half of the contest in particular darting in and out, landing a punch or two or three and then moving out the way before Bradley could lock and load. In the early stages, the contest had fight-of-the-year written all over it, as Bradley sought to steer Pacquiao onto a big right hand and to brutalize his body to slow down his 36-year-old legs. He did so to greatest effect in the fourth, answering a short southpaw right hook from Pacquiao with a booming right hand that sent the Filipino backward. That came on the back of a wild third round that saw the two combatants exchange furious punches – a short right from Pacquiao, a left from Bradley, a Bradley uppercut, a Pacquiao left hand – that whipped the 15,601 fans into a frenzy. 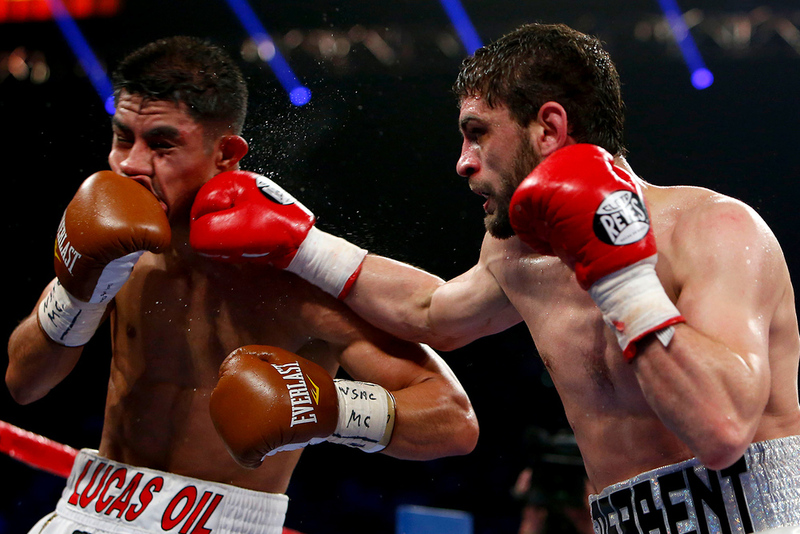 Through five, Bradley (31-1, 12 KOs) was in the ascendant. His twisting upper body movement and sharp defense nullified Pacquiao's offense, and his booming right hand counters made that offense positively dangerous. Then the tide turned. Pacquiao dialed back on his power, darting in and out and denying Bradley the opportunity to land the big punch he craved. As Jim Lampley observed during the broadcast, Bradley was looking for a home run while Pacquiao was happy to hit doubles. The seventh was perhaps Pacquiao's most dominant, as he pinned Bradley to the ropes and unleashed several rounds of flurries. Bradley beckoned him on, daring him to attack, and Pacquiao paused warily before resuming his assault and then backing away again. Again, Bradley waved him on, this time landing the counter right hand he sought. 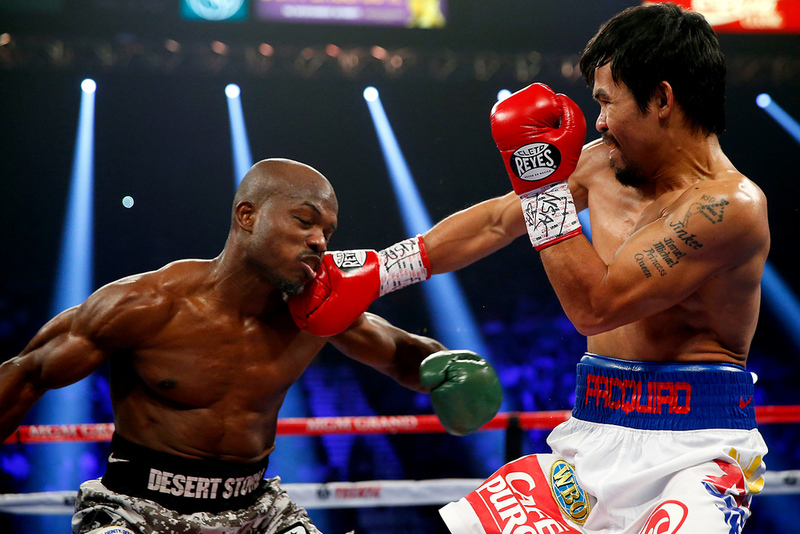 Unmoved, Pacquiao attacked again, punctuating the sequence with a left hand that stunned Bradley. Bradley had his moments over the rest of the fight, including some hard combinations in the ninth that went unnoticed by the highly partisan crowd, which probably had Pacquiao winning by 37 rounds to none and scoring two knockouts along the way. But Bradley's body language looked dejected, his punches were wild and ragged, and when the official verdict came, he acknowledged its accuracy. "I tried. I really tried," he said. "I wanted that knockout. I kept trying to throw something over the top. Manny's a great fighter, maybe one of the best ever. I lost to one of the best." "Bradley is a better fighter than he was in the first fight," said Pacquiao. "He hurt me on the chin. Tim Bradley was not an easy fight. He threw a lot of punches and I didn't want to be careless. In the second half of the fight, I listened to my corner and they told me to work on the timing of my punches. Freddie [Roach, Pacquiao's trainer] told me to make adjustments and I did. "I think I can fight for another two years. I'm so happy to be a world champion again." The last time Ray Beltran appeared in the ring, he was flat-out robbed when he was given a draw against then-lightweight titlist Ricky Burns in a fight he seemed to have clearly won. This time around, on the Pacquiao-Bradley undercard, the judging was more in touch with reality, as Beltran scored a unanimous decision win over Arash Usmanee in an entertaining twelve-round scrap. Usmanee's awkward style – all loose limbs and constant movement – sometimes made it hard for Beltran to connect cleanly, but when he did, he landed with sufficient authority to show that Usmanee has a heck of a chin. Both men fought at a fast pace and between them threw well over 1,200 punches. Although Usmanee was more active, Beltran was the more accurate, the harder hitter and the man who forced the action. As the final round came to a close, the two men slugged at each other with abandon to the delight of the crowd, but as they hugged each other sportingly after the bell, there was no real doubt – beyond the usual concerns about the vagaries of judges - that Beltran was the victor. Las Vegan super lightweight Jesse Vargas scored a unanimous 12-round decision win over Khabib Allakhverdiev to maintain his unbeaten record and end that of his Russian opponent. 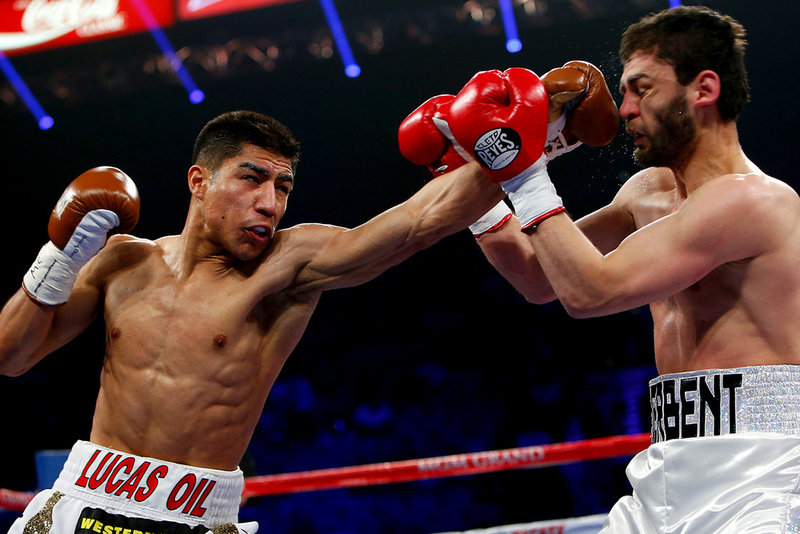 As is often the case with Vargas, it was a performance more workmanlike and technically proficient than exciting, but it was enough to turn back the pressure from the aggressive but overly predictable Allakhverdiev. The Russian had to cope with a bad cut over his left eye, and a swollen and closing right eye in the final third of the contest, but those were ironically the rounds in which he appeared to be the most effective. 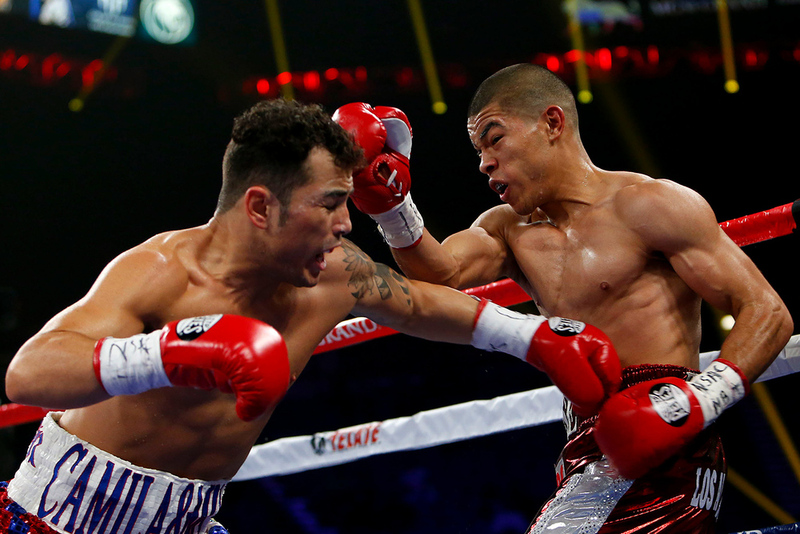 Most ringside observers saw him as the winner of a close decision, but Vargas' more varied offense and sharp counter-punching clearly caught the judges' eyes. In the opening bout of the pay-per-view, Costa Rica's Bryan Vasquez outworked and outclassed Jose Felix, sending the Mexican to his first defeat in a twelve-round super featherweight bout. Felix began brightly enough, spearing the onrushing Vasquez with snappy jabs and sharp counter hooks; but by about the third or fourth round, Vasquez was neutralizing the counters with subtle head movement and a solid defense, and, applying constant pressure, was able to work his way inside and land combinations of short punches. It was at times an odd fight. There were a couple of accidental headbutts, one of which raised a nasty welt by Felix's right eye, and the Mexican was guilty of several low blows and even a knee to the groin. The point that referee Robert Byrd deducted for that unusual transgression proved decisive; although the consensus ringside was that Vasquez had dominated down the stretch, two of the judges scored the contest 114-113, while the third saw it as 117-110 – the trio of scores enough to give Vasquez a deserved decision. The last time Ray Beltran appeared in the ring, he was flat-out robbed when he was given a draw against then-lightweight titlist Ricky Burns in a fight he seemed to have clearly won. This time around, the judging was more in touch with reality, as Beltran scored a unanimous decision win over Arash Usmanee in an entertaining twelve-round scrap. Watch all three parts of 24/7 Pacquiao vs. Bradley Jr. before tonight's HBO PPV rematch from the MGM Grand in Las Vegas. Manny Pacquiao and Timothy Bradley Jr. step on the scales at the MGM Grand in Las Vegas. Miguel Cotto, Terence Crawford, and Ruslan Provodnikov offer their input on Saturday's HBO PPV fight between Manny Pacquiao and Tim Bradley.